The old saying of “pain in the neck”… is literally a pain in the neck in today’s keyboard warriors. If you are sitting all day in front of the computer either at work or home, then your neck pain is likely as a result of the tight muscles that support your neck. A combination of poor neck posture, bad work station set up and sustained positions have lead to your neck muscles to become very tight and painful. // Did you know that tight muscles in the neck can cause headaches, eye pain and dizziness? Tight muscles can lead to more sinister problems such as nerve impingement and neck joint arthritis if not fixed in its early stages. These problems may be irreversible! Stretch! 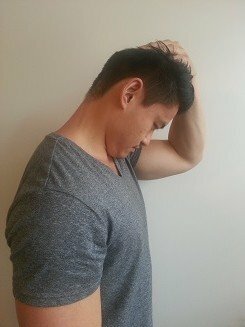 Here are my top 5 stretches for the neck that you can easily do at work. I suggest you hold these stretches for at least 30 seconds and repeat 3-5 times throughout the day (or as per needed). ***WAIT! READ THIS FIRST BEFORE YOU STRETCH! Stretching is what I refer to as a “game of angles”. To get the most out of these stretches, you need to play around with the force and angle you apply to your head. Generally speaking, if it feels intensely tight at a certain angle, keep at it! You are on the right spot. With your hand on the side of your head, gently pull your head down towards your shoulder. Reach down and fixate your other arm to ensure the shoulder does not hitch up as you are applying for the force to the side of your head. Place your hand on the top portion of your chest and apply a pulling down pressure. Tilt your head diagonally away from your hand. With your hand on the back of your head, gently pull your head down towards your armpit. With your hand at the back of your head, gently pull your head down towards your chest. Tuck your chin in (pretend that you’re making a double chin). Whilst holding this position, gently nod your head until you feel a firm stretch at the back of your neck. 1. If I have pain on one side, should I stretch the other side too? Yes. Unless you have perfect posture, it is likely that you will have some tight and overactive muscles on both sides of your neck. You may wish to invest more time stretching on your tighter side if appropriate. 2. I have sharp/stabbing pain when I stretch. Is this normal? No. Sharp pain is not normal. You should feel a strong stretch sensation which may feel somewhat painful, but should never feel like a knife to your neck. 3. Can I stretch for longer than 30 seconds? Yes! In fact, I encourage most of my patients to stretch more at least 1 minute to get the most out of the stretch. You want to try to what I refer to as to “fatigue the stretch” where you stretch until you can no longer feel the stretch. 4. Stretching is causing me severe dizziness and/or headaches. What’s happening? Stop. All of these stretches should not invoke any severe dizziness or headaches of any kind. If you’re new to stretching and unaccustomed to it, it is normal that you may experience some light symptoms. If this is the case, do not place as much stretch on the muscle. Start light and apply more gentle pressure as tolerated. If the dizziness and headaches persist, cease stretches and seek medical attention. You may have issues with the blood flow in the artery in your neck. 5. I heard a clicking noise when I was stretching. Is my neck broken? Unlikely. The clicking noise refers to the neck joints re-position under a stretch load. This can be a good thing as it may loosen up your stiff neck. If there is any pain associated with the clicks, stop the exercise and continue with the other pain-free stretches. 6. My neck hurts after I stretch. What do I do? It is normal to feel a degree of tenderness after stretching out a very tight muscle. This sensation should only last 1-2 days. Stretching too vigorously may also cause this, so please monitor the amount of pressure you place on your stretch. If you do these simple but effective stretches on a regular basis, I am very certain that there will be a significant reduction in your neck pain. … I’ve been stretching my neck for a couple of days now, but my neck pain is still there. Is it not working? There may be a couple of reasons why your neck still hurts. Another aspect of your posture may need to be addressed. It’s only been a couple of days. You have likely had tight neck muscles for a long time now, and may take longer than a few days to sort out your stiffness. Be patient and persistent. Excellent tips on your website. I would like to if my neck shoulder pain/stiffness are related to postural issues. The pain though mild occurs when I look up or bring my chin to my chest. This has been ongoing for more than 2 years and chiropractor visits are not helping much. What do you think these symptoms point towards? Thanks for your advice in advance! Have a look here: Forward head posture. This may be a factor in your neck pain! I have started to follow the stretches and find the back next stretch MOST useful! I usually sit for ~10 hours and have had stiffness in the back and neck. I love the neck exercises. What exercises do you recommend for stiff back and slight pain in the upper left back. You say tight neck muscles can give you diziness & eye troubles as well as headaches. I have been suffering with all of these for about 25 yrs, brought on by bad posture. I have seen a physio recently which gave me a couple of the exercises you talk about & saI’d that my posture was the cause of all these. I’m concerned about the off balance I feel a lot of the time, the physio didn’t say to much about this? I have had a lot of massages in the past seen a lot of people had the needling which I felt worked most. Could my off balance be a result of poor blood supply like you mentioned or is it just my bad posture, which I’m working on with your exercises ax wel im probably just very impatient. hope you have some answers for me. You will need to treat these 2 factors differently. More serious issues involve the brain, blood work imbalances, blood flow impairments. I deal with a lot of neck pain and so I have started to do the side neck stretch just out of instinct. However, my neck pops every time that I do this and sometimes multiple times. The pop is very loud, but it does relieve some pain. Should it be popping like this? I don’t feel like I am stretching it too vigorously and so that is why I am curious. The pop you hear is likely coming from your joints in your neck. Whilst popping it may give you relief, this is usually temporary and the need to pop it again will come back. It is likely that your posture is causing the joints responsible for the popping to become stiff. If you fix the posture, you will not need to pop the neck.